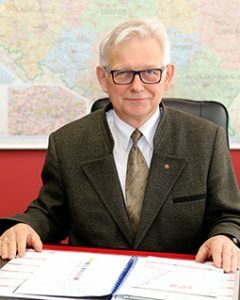 He completed his studies at the Silesian Technical University in Gliwice at the Faculty of Mining and Geology and postgraduated studies in mining aeronautics and mine rescue at the Silesian Technical University and AGH University of Science and Technology in Cracow. In 2002 received a PhD in technical sciences in the field of mining and security aerospace. He also graduated from the School of Managers in the Polish Foundation for Human Resources Promotion, specializing in managing mines and commercial law companies under the terms of the mining industry restructuring, as well as the US course on general security and crisis management. Career: After graduation, he started his professional career at KWK “Andalusia”, from the post office to the chief ventilation engineer. Throughout his 21 year career, he was involved in mine rescue. In the years 1997 – 2006 worked at the Central Mine Rescue Station in Bytom, as an ambulance manager of the chief engineer, then he was elected the director of the Regional Mine Rescue Station in Zabrze. 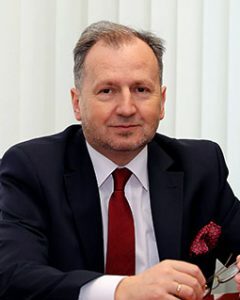 In 2006, he was appointed to the post of President of the Mining Authority in Katowice, which he held until 2008. Since 2004 he has been lecturing at the Mining Institute of Mining Technology of Silesian University of Technology in Gliwice. He holds a law degree in mining and geology at the District Court in Katowice. He is a member of the Mining Committee of the Polish Academy of Sciences and other scientific and trade committees. Until 2010 chaired the Polish Organizing Committee of World Mining Congresses. Before in 2008, chaired the Governmental Mission to investigate the causes of the mining disaster in Ukraine where 101 miners died, including mine rescuers. In February 2016 he was appointed to the Mining Council, where he was given the position of Vice-President of the Council and Head of the Underground Mining Council. The Mining Council is a body of opinion and consultation for the Minister of the Environment in the field of mining and geology. Within its competence, the Mining Council cooperates with the Ministry of Energy. He is the author of more than sixty articles and papers published and presented at numerous scientific conferences. 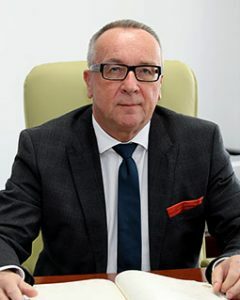 Since December 2014 he has been the Chairman of the City Council in Piekary Śląskie. In June 2016, he assumed the position of President of the Board of the Central Mine Rescue Station. Hobbies: music, jazz pianism, faithfulness to the traditions of Silesia, founder of the Zabrze Festival of the Silesian Orchestra and Piekary Brass Orchestra review. From June 21st 2016, Vice President of Technical Services at Central Mines Rescue Station in Bytom. He completed his studies at the Silesian University of Technology in the mining department specializing in the design and construction of mines. He started his professional career in an enterprise building underground coal mines, passing his career ranks from trainee to a person supervising the work of more than 200 people. He then worked as a deputy director in the mining supervisory offices from 2004 to 2016 in the State Mining Authority. His duties included supervision of the rescue services of the entrepreneur and those who were professionally engaged in mine rescue. He participated in many rescue operations and also took part in the work of the commissions appointed by the President of the Higher Mining Authority to investigate the causes and circumstances of dangerous occurrences. He is the co-author of a number of legal acts concerning the Mining Rescue Regulations. Co-organizer of the International Mines Rescue Competition, which took place in 2004 and 2016. He graduated from the Academy of Social Sciences in Katowice, where he earned a master’s degree in economics and post-graduate studies at the WNSN in Tychy, Warsaw School of Economics and AE in Katowice. He has the rights to service bookkeeping, sit on the supervisory boards of companies of the State Treasury, as well as the conducting of controlling. His professional career started underground in the mining industry, passing his career level from the electrician’s standpoint to the independent position of the senior inspector for the development of a mining plant specializing in economics. He has held managerial positions. in the Nadwiślańska Coal Company S.A., Rybnicka Spółka Węglowa S.A., Kompania Węglowa S.A., as well as in companies not connected with the mining industry. From August 2008 to July 2013, he served as a Member of the Management Board – Vice President for Economics and Finance at the Central Mine Rescue Station S.A. From August 2013 to June 2016 he held the position of commercial director in the Enterprise of Automation Systems and Automation Syst. in Tychy. On June 21, 2016, he was reappointed to the position of Vice President of Economics and Finance at the Central Mine Rescue Station.